Corsair's Voyager Mini somehow packs 4GB of capacity into this wee portable flash drive, which is no bigger than a man's fingernail. Surrounding the drive is a casing of tough rubber over hardened plastic, and a flick switch that pushes out the USB dongle. It's a tiny format that's slim enough fit into an Apple keyboard's USB slot with no bother. Corsair prides itself on these 'tough' drives. It frequently invites members of the public to test the ruggedness of their design and post videos of the results. YouTube has clips of cars and microwaves being let loose on the things. Like its other models, this one's heat-proof (within reason), water-resistent and survived a gutsy hurl at a wall. Peace of mind is further nurtured by the ten-year warranty. We found that the drive works as advertised. 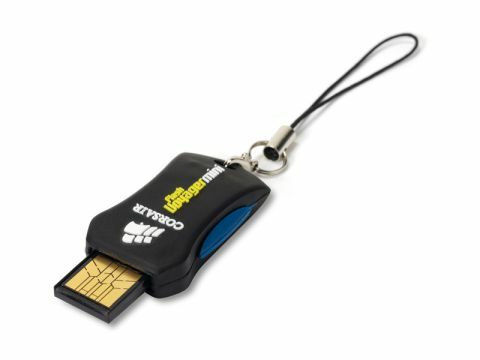 We particularly like the key ring attached to it for ease of transport, but it's the diminutive size and large capacity that win the day. It's hard to knock the price, too.